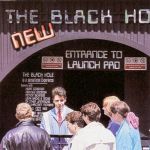 Black Hole in the early 90's with its original yellow and green colour scheme. Black Hole with its original yellow and green colour scheme. A photograph from the early eighties shows Black Hole shining new.